On Thursday, the Asus has launched the world’s first Gaming phone with a 3D vapor cooling system in India. 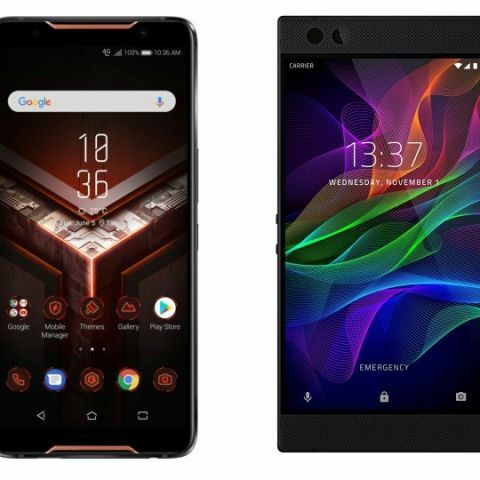 We are comparing the device with the Razer gaming smartphone to see which one comes with a better hardware? The Asus has launched its gaming smartphone “Rog” in India on Thursday. The phone features an AMOLED display and comes with a 3D vapor cooling system. On the other side, we have the Razer gaming smartphone that comes with a Qualcomm Snapdragon 835 processor, an 8GB RAM, and 4000mAh battery. 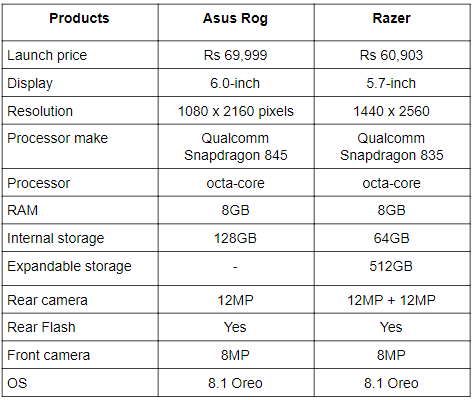 Let’s do a quick specification comparison to know which gaming smartphone provides the best value for your money? The Asus Rog sports a 6.0-inch display that comes with a resolution of 1080 x 2160 pixels. On the other hand, the Razer gaming smartphone features a slightly smaller 5.7-inch display that offers a resolution of 1440 x 2560 pixels. When it comes to the performance, the Asus Rog is equipped with a faster Qualcomm Snapdragon 845 processor, while the Razer gaming smartphone is powered by a Qualcomm Snapdragon 835 octa-core processor. As far as the cameras are concerned, the Asus Rog features a single 12MP unit at the back with an 8MP sensor on the front. If you’re looking for a smartphone with a dual camera setup then the Razer gaming smartphone might fit the bill, as it has a dual 12MP + 12MP rear cameras with an 8MP unit on the front. The Asus Rog is launched in India at a price of Rs 69,999, while you can get the Razer gaming smartphone for Rs 60,903 in India.